A stirring second-half performance by Bath secured a thrilling victory and put an end to Leicester's slim chances of finishing higher than fourth. 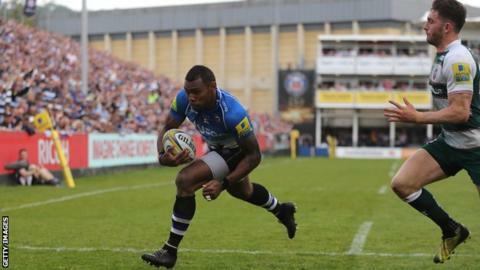 Tigers, already sure of a Premiership play-off place, trailed to Semesa Rokoduguni's early breakaway score. But they then dominated and led at the interval thanks to tries by Fraser Balmain, Peter Betham and Mathew Tait. Bath, who stay in ninth, blitzed the visitors thereafter, running in four tries to one to earn a comfortable win. Ollie Devoto, Francois Louw and Rokoduguni all went over in a barnstorming start to the second period, and after Will Evans touched down from close range for Tigers, Bath made sure of the points with a late Jeff Williams score. Leicester needed a miraculous sequence of events to finish second in the table, but the prospects of climbing to third looked possible after a spirited first-half effort by a slightly weakened team. Exeter and Wasps both had to lose without any bonus points, with Tigers needing a bonus-point victory. In the event, Exeter hammered Harlequins to claim a home last-four tie and Wasps thrashed London Irish to stay third, giving Leicester an away semi-final at Saracens. Prop Ellis Genge, making his full Tigers debut, was a hugely influential figure and played a key role as the away side's forwards took control with some impressive handling and ball-carrying up front. Balmain bundled over to cancel out Rokoduguni's converted effort and Jordan Crane laid the platform for Betham to put Tigers ahead. Tait's score, which was converted by Owen Williams, put a nine-point gap between the sides, but Bath responded almost immediately after the restart as Anthony Watson's brilliant burst ended with a simple try for Devoto. Louw's try, a Rokoduguni score in the corner and the reliable boot of George Ford put the hosts well on top. And, having survived a spell of pressure after Evans squeezed over, replacement Jeff Williams broke away to close out victory in style. "It's a win, which is great for me because you don't want to be dwelling on a loss too much. Could it have been better? It could have been a lot better. "At half-time we just talked about the drive to win and going out to take the game and put that extra yard and energy in. "This is their second or third team, but we've got to move on from here. We are going to learn from this year and are going to come back stronger." "Bath were second last year and now they're ninth. We're in our 12th play-offs on the trot and 10 of those have been Grand Finals. "We're a strong club with a strong history. Sometimes you get beaten - but we're still in a semi-final. "We have good systems and work pretty hard, as is our recruitment. And we're pretty belligerent. There's a bit of a party atmosphere around Bath this afternoon - but you wouldn't get that at Leicester if we finished ninth." Bath: Watson; Rokoduguni, Joseph, Devoto, Banahan; Ford, W. Homer; Catt, Webber, Wilson, Ewels, Attwood, Garvey, Louw, Denton. Replacements: Dunn, Lahiff, Palma-Newport, Day, Houston, Cook, Priestland, Williams. Leicester: Tait; Thompstone, Betham, Roberts, Catchpole; O. Williams, B. Youngs; Genge, Ghiraldini, Balmain, Slater, de Chaves, Croft, Evans, Crane. Replacements: Thacker, Mulipola, Bateman, Barrow, Pearce, Kitto, Bell, Worth.